Are you researching for the best rhinoplasty surgeon in San Diego, CA? Interested in cosmetic rhinoplasty, nonsurgical nose surgery, revision rhinoplasty, or the cost of rhinoplasty in San Diego? In these pages you will find answers to many of the most common questions we receive about nose job surgery. Check out our gallery for hundreds of Before & After rhinoplasty pictures! With so many clinics and practices offering nose surgery in San Diego, why choose Dr. Kolstad? In short, rhinoplasty is complicated. The best nose job surgeons in San Diego will have a high volume of rhinoplasty surgeries. Dr. Kolstad is a facial plastic surgeon who’s core specialty is rhinoplasty. Dr. Kolstad will not take any shortcuts during your nose surgery, spending an average 2-4 hours making sure that your nose will look and function at its best. Dr. Kolstad is known for his ability to customize your rhinoplasty to meet your goals and features. Every face is unique and your nose job surgery should be tailored specifically to bring your nose into balance with your other features. During your consultation, Dr. Kolstad can use medical software to illustrate potential changes to your nose that can be accomplished with nose surgery. After viewing the computer enhanced images you will have the ability to request alterations and customize changes you would like to see. You will have the final say in determining if this is the right nose for you. Dr. Kolstad’s most important goal is for your rhinoplasty to look perfectly natural. We do more than just talk about natural results, we have hundreds of examples to show you in our before and after photo gallery. We have a diverse community with people from every part of the world. Many nose job surgeons in San Diego will have the same rhinoplasty result for every face. Dr. Kolstad specializes in achieving natural results that match your unique features as well as your ethnic background. If you would like more information about how Dr. Kolstad makes changes to match your ethnic background check out our pages on Asian rhinoplasty, Hispanic rhinoplasty, Middle Eastern rhinoplasty and African American Rhinoplasty. IS SAN DIEGO RHINOPLASTY RIGHT FOR ME? 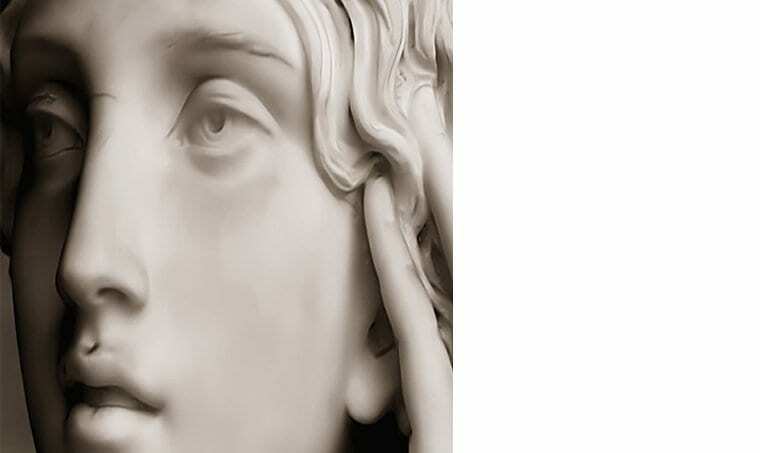 A nasal tip that droops, is over projected, is asymmetric or is too broad. Nostrils that flare when you smile or collapse when you breathe in. A crooked bridge or dorsal deviations. Deviated septum, inferior turbinate hypertrophy or difficulty breathing. WHERE ARE THE INCISIONS FOR OPEN RHINOPLASTY? The W-shaped incision used for open rhinoplasty is depicted in the image. A) The external incision is placed on the narrowest part of the columella and shaped like a “W”. When repaired using plastic techniques this incision can be difficult to find and tends not to bother most patients. 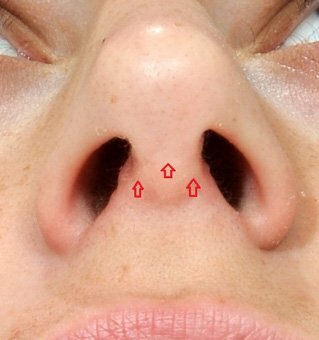 B) There are two internal incisions hidden on the under surface of the nostrils and one internal incision on the septum. WHERE ARE THE INCISIONS FOR NOSTRIL AND ALAR BASE REDUCTION? A) If the nostril is too large a “pie” shaped wedge is removed where the nostril inserts onto the face. Even when repaired using plastic techniques this incision will appear like a faint red line that can be visible to a viewer. B) If the nostrils are too wide a “pie” shaped wedge is removed from the base of the nose. When closed using plastic surgery techniques this incision is sometimes visible as a faint red line. ARE THERE SCARS AFTER OPEN RHINOPLASTY? A healed incision 12 months after open rhinoplasty is depicted in the image. * Individual results may vary. The internal incisions are on the undersurface of the nostrils and the septum and are rarely visible. The incision on the columella heals very well and is frequently only barely perceptible. HOW LONG DOES IT TAKE TO RECOVER FROM NOSE JOB SURGERY? Dr. Kolstad recommends taking 1-2 weeks to recover from rhinoplasty surgery. There are several visits during the first week to check on the healing and make sure that all of your questions are answered. Many of our patients do not complain of significant discomfort during the recovery period. Typically by two or three days after surgery many patients require only Tylenol for discomfort. Prescription pain medicine is made available to you and we recommend that you have it available in case it is needed. For the majority of our patients the recovery follows a similar experience. Day after surgery: Dr. Kolstad removes the small packing from the nose. He reviews the instructions for cleaning and moisturizing the nose to prevent scarring. Four days after surgery: The external sutures are removed and the incision is covered using steri strips. 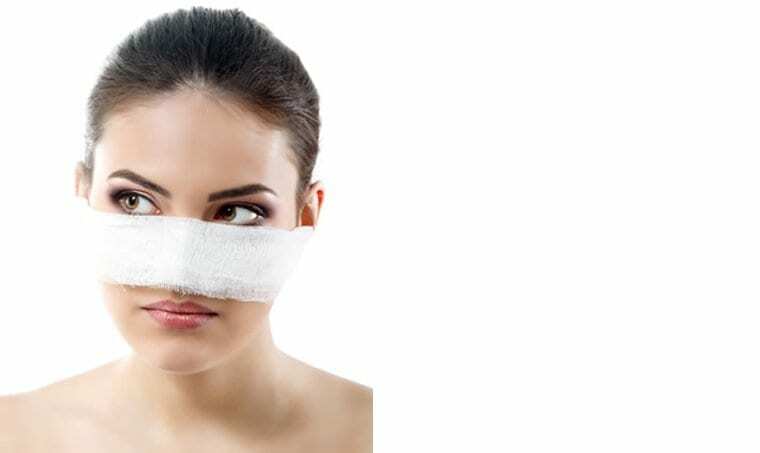 Seven days after surgery: The rhinoplasty splint is typically removed seven days after surgery. The nose will look swollen but many people feel comfortable enough to return to work. For people wanting to take extra time to make sure the bruising is gone we recommend taking two weeks to recover. Dr. Kolstad reviews instructions including nasal taping and massaging exercises. Dr. Kolstad advises initiating scar creams over the columellar incision. Fourteen days after surgery: Dr. Kolstad meets with the patient, examines the internal incisions and clears them for full activity. Three weeks after surgery: At this point it is safe for most patients to wear sunglasses or resume contact sports / activities. Six weeks – 12 months after surgery: Dr. Kolstad uses many injectable medicines to recontour the nose throughout the year. Some patients are recommended to return every month for injectable steroids some are seen less frequently. 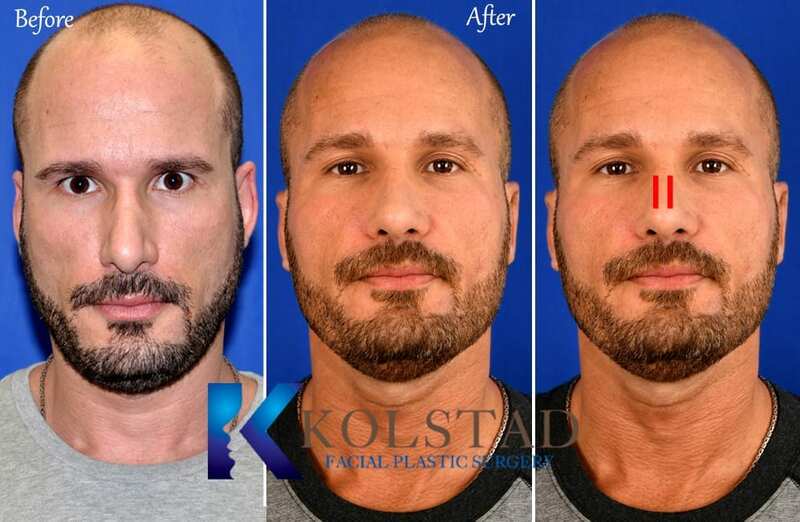 Dr. Kolstad takes a very hands-on approach during the recovery in order to achieve the best possible result. It is common for some bruising under your eyes after San Diego rhinoplasty surgery. With frequent use of ice packs the bruising is typically minimal and does not bother the majority of people. Dr. Kolstad recommends that his patients obtain cover-up make-up prior to surgery to help camouflage any postoperative bruising. WILL I HAVE A “PLASTIC LOOK” AFTER RHINOPLASTY SURGERY? A frequent concern of our patients is looking “plastic” after a La Jolla rhinoplasty procedure. There are limitless examples of unnatural, operated results. When surgeons remove too much structure, the nasal tip can look overly narrow. It is very important to choose a San Diego plastic surgeon that specializes in operating on the face. Dr. Kolstad is an expert in nasal cosmetic surgery and is known as the face specialist, because put simply, that is all he does. WHAT TO EXPECT AFTER NOSE JOB SURGERY? WHAT ARE THE RISKS AND COMPLICATINONS WITH RHINOPLASTY? Elective rhinoplasty for cosmetic/aesthetic reasons is not covered by insurance in the vast majority of cases. If, however, at least part of the goal of this surgery with Dr. Kolstad is to improve nasal function or to correct any traumatic nasal deformity, then the procedure may be partially or fully covered. Our team at Kolstad Facial Plastic Surgery will work with your insurance company to achieve the best reimbursement. AM I TOO OLD TO HAVE RHINOPLASTY? There really isn’t an upper age limit for rhinoplasty. As long as the patient is healthy, then there’s no reason just because they are older they have to continue to live with a nose they hate. Nose surgery can also improve function, which can help keep tissues prone to sagging from interfering with breathing, especially while sleeping. ARE THERE OTHER SURGERIES I COULD COMBINE WITH RHINOPLASTY? As a facial plastic surgeon, Dr. Kolstad also performs eyelid surgery, brow lifts, chin augmentation, facelifts, and neck lifts. While he wouldn’t recommend having a facelift in coordination with nose surgery, other procedures, such as eyelid surgery, can be combined. Doing so does limit some of the costs involved with anesthesia, the facilities, and the like. But patients also need to remember it will increase what is involved in their recovery. During your consultation with Dr. Kolstad, you can discuss the pros and cons of combining your rhinoplasty with a possible second procedure. What Is The Best Rhinoplasty For Me? Every face is unique. Dr. Kolstad’s expertise in rhinoplasty allows him to design a procedure that fits your features, ethnicity and background. Open and closed rhinoplasty are different types of surgeries designed to improve the shape and appearance of the nose. Both procedures primarily use incisions placed inside of the nose to access the nasal cartilage. Open rhinoplasty indicates an incision placed on the columellar skin. The columella is the strip of skin located between the nostrils. The most common incision in this area is shaped like a “w” although a “z” or “inverted v” incisions can be used as well. With the use of a columellar incision the skin can be elevated from the underlying cartilage and bone. This allows the surgeon to view the nasal framework in its natural orientation and position. Direct visualization of the nasal tip cartilage allows for more precise cuts and reshaping. The disadvantages of open rhinoplasty are a visible scar on the skin and more swelling after surgery. For the majority of patients the external incision resembles a thin line on the skin and does not draw significant attention. The earliest form of cosmetic nasal surgery popularized in the 1970s employed the closed rhinoplasty technique. Closed rhinoplasty places all of the incisions on the inside of the nose and avoids external scarring. Closed rhinoplasty can be performed in 90 minutes leading to less swelling after surgery. 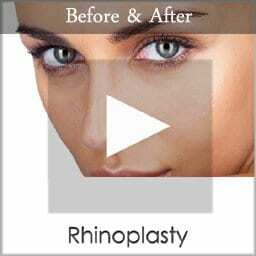 This type of rhinoplasty is still popular today and has many contemporary indications. Dr. Kolstad used the closed technique to address humps on the nose or crooked nasal bones. He does not perform changes to the nasal tip cartilage using closed rhinoplasty. Dr. Kolstad believes that the use of nasal tip grafts lead to superior outcomes and require an open approach. Limitations of closed rhinoplasty are the inability to visualize nasal tip cartilage in it’s natural position while making incisions. Plastic appearing nose jobs, pinched, asymmetric tips and nasal obstructions are common shortcomings that can happen when using the wrong technique for the wrong nose. Securing cartilage grafts used to reshape and support the nose can be difficult to impossible when using the closed rhinoplasty approach. 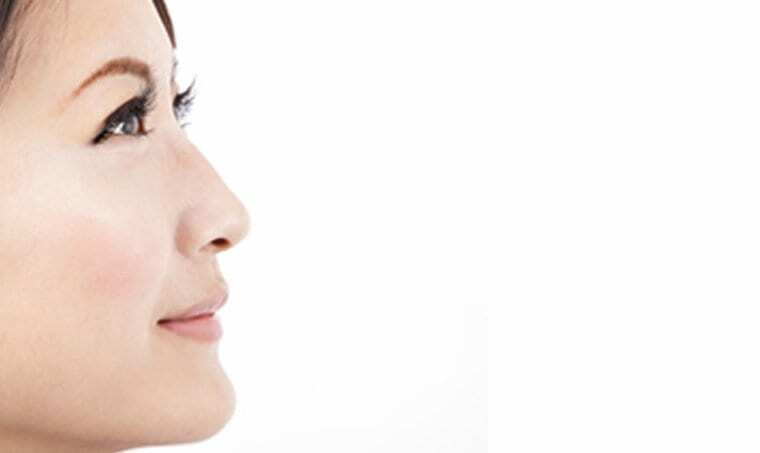 WHICH IS BETTER, OPEN RHINOPLASTY OR CLOSED RHINOPLASTY? The decision to perform an open or closed rhinoplasty is best determined by your surgeon. Both techniques have advantages and limitations. Depending on your features and goals you may a better candidate for either technique. Dr. Kolstad does not have one surgery for every nose and different options for your nose will be discussed during your consultation. – The cartilage is viewed in its natural orientation when cuts are made leading to more precise incisions. – Cartilage grafts can be used to reshape and strengthen the nose. 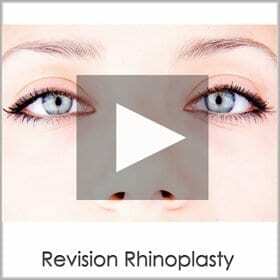 – Only suitable approach for large revision rhinoplasties. – Can correct anatomical breathing obstructions as well as improve the nasal appearance. – The surgery typically takes longer than closed rhinoplasty leading to more swelling and scar tissue after surgery. – The “w” shaped incision creates an small scar on the skin. – Less swelling after surgery. – Less internal scarring of the nasal soft tissue. – No external incisions or scarring. – The surgery can be peformed in 90 minutes which should reduce the cost of surgery. – Cannot visualize the cartilage or bone in it’s natural anatomical position. This leads to less precise cuts and refinements. – Cannot suture bridge cartilage increasing the risk of collapses after surgery. – Difficult to apply cartilage grafts used to reshape the nose. – Difficult to impossible to perform challenging reconstructive rhinoplasty through a closed approach. HOW DO I FIND A TOP RHINOPLASTY SURGEON? One of the most important aspects of cosmetic surgery is choosing the right surgeon. In California, and in particular Southern California there are hundreds of providers all seeming to offer the same service. The good news for patients is that most surgeons performing rhinoplasty are well-trained and can achieve good results. Also, being located in a region that has many providers allows patients to choose a surgeon that is the best fit for them instead of having to choose the only surgeon in town. Finding the best rhinoplasty surgeon requires a bit of research, but all the necessary information is only a few clicks away. Dr. Kolstad always says that the most important thing a patient can research is the pictures. How do you find the best rhinoplasty surgeon? Study the before and after rhinoplasty images. A great rhinoplasty surgeon should have great results. More than any other plastic surgery rhinoplasty relies on artistic creation. Every surgeon will have a different philosophy on what makes a nose beautiful. Make sure that your surgeon creates noses that are consistent with your goals for the procedure. Dr. Kolstad believes the two medical boards that best regulate the credentials of their members are the American Board of Facial Plastic Surgery and the American Board of Plastic Surgery. Your surgeon should be board certified/eligible by one of these boards. Check the website of your state medical board to see if a surgeon has any actions / censures against them. Bad apples will typically have multiple complaints. Your surgeon should be able to perform the rhinoplasty at a local hospital. Hospitals go through lengthy review processes before granting surgical privileges. Even if the nose job surgery is scheduled to be done in an outpatient center, every surgeon should be credentialed at a nearby hospital. WHEN DO I SEE THE FINAL RESULTS AFTER RHINOPLASTY? One of the most common questions we are asked about rhinoplasty is how long does it take to see the final results? The short answer is that it’s complicated. Every patient experiences a unique healing timeline. Dr. Kolstad typically advises patients that it takes a full year for the nose to take its final shape and form. The good news is that most patients do not have to wait a full year for the nose to look good. They just have to wait a year for the nose to look its best. For example, the skin along the bridge of the nose is very thin. Profile views showing a hump reduction will look significantly better only 2 to 3 weeks after surgery. The actual time to reach the final result primarily depends on the skin thickness. Thicker skin takes longer to shrink. Most people describe the tip of the nose as looking “puffy” for the first several months after surgery. Throughout the year the ‘puffiness’ refines into a more narrow and contoured nose. People with average thickness of the nasal tip soft tissue will experience mature, final results in about 12 months. Patients with thinner nasal tip skin will heal sooner and those with thick soft tissue can take a year and a half to achieve final results. DOES SKIN THICKNESS AFFECT RHINOPLASTY RESULTS? The most challenging variable to control in every rhinoplasty surgery in San Diego is the skin. The best rhinoplasty results require an ideal skin thickness. Soft tissue that is too thin is difficult to fix and skin that is too thick is equally as challenging to change. Nose job surgery is designed to reshape cartilage and bone. Every rhinoplasty surgeon redrapes the skin over the new cartilaginous framework and waits for the soft tissue to shrink wrap to the new form. Skin that is too thin will shrink too much and heal like saran rap. Dr. Kolstad believes one of the most striking changes to Michael Jackson’s nose was the skin becoming too thin. Thin skin accentuates irregularities and imperfections. Thin nasal skin needs to be thickened using open rhinoplasty grafting. Dr. Kolstad frequently ‘thickens’ thin skin with temporalis fascia (flexible soft tissue from the side of the head). The opposite side of the same coin is skin that is too thick. Thick skin does not shrink. Thick skin frequently leads to an amorphous, round nasal tip blob. Thick skin will camouflage and hide all of the changes that were made to the nasal tip cartilage. For most people there are no liposuction or surgical techniques that can decrease thickness of the nasal skin. The most important way to control thick nasal skin is to identify it before surgery. Patients with thick soft tissue require special grafting techniques to achieve the best results. Dr. Kolstad will typically use shield grafts to make thick nasal tip skin more narrow and refined. WHAT ARE CARTIILAGE GRAFTS USED FOR IN THE NOSE? Modern techniques in rhinoplasty use cartilage grafts to reshape, support and strengthen the nose. Earlier forms of rhinoplasty relied on removing cartilage to make the nose skinny. If too much cartilage is removed from the nose the results can be disasterous. Pinched, asymmetric nasal tips are frequently the result of over resected nasal tip cartilage. Nostril collapse and the inability to breathe through the nose are common when the nose is weakened at the time of surgery. 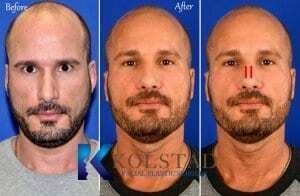 Dr. Kolstad practices the newest form of nose surgery called “open structural grafting rhinoplasty”. Dr. Kolstad borrows cartilage from the septum and sculpts it into tiny grafts applied to the nostrils, the nasal tip, the bridge and other areas of the nose. Cartilage grafting rhinoplasty strengthens the nose and minimizes the risk of nasal collapse or breathing difficulties after surgery. A nasal tip shield graft is cartilage sculpted into a shape resembling a triangular shield. This type of graft is only used in nasal tip rhinoplasty. The graft is attached to the lower part of the nasal tip cartilage (medial crura) with thin sutures. Dr. Kolstad typically uses cartilage from the septum to create grafts used during rhinoplasty. A shield graft has many useful applications. 1) Rotation: shield grafts can be used to increase or decrease the nasal tip angle of rotation. 2) Projection: shield grafts can increase the projection (the distance the nose sticks out) of the nasal tip. This technique is most commonly used for Asian rhinoplasty. Increasing the projection can make a round, flat nasal tip more refined and angular. 3) Support: strengthening nasal tip cartilages makes them less likely to twist, warp or buckle after surgery. Older rhinoplasty techniques were prone to asymmetric results due to scar contracture during the healing process. Frequently too much cartilage would be removed leaving the nasal tip in a weakened, unsupported state. 4) Symmetry: Dr. Kolstad will commonly use shied grafts to improve the nasal tip symmetry. The right and left tip cartilages can be secured midline at the same height, projection and angle of rotation. If you are concerned about nasal tip asymmetry a shield graft can frequently make the nose more symmetric. 5) Fix nasal tip bifidity: many patients will notice a cleft or shadow in the middle of the nasal tip. Placing a shield graft over the medial crura will eliminate the cleft and make the nose appear more uniform. WHAT IS A SPREADER GRAFT? A spreader graft is cartilage applied to bridge of the nose. Spreader grafts are most commonly used to straighten a crooked nose or to fix internal valve obstructions. Spreader grafts need to be strong and can only be obtained from septal or rib cartilage. Auricular (ear) cartilage is not stiff or long enough to create spreader grafts. Dr. Kolstad commonly uses spreader grafts in revision rhinoplasty to fix noses that are asymmetric, crooked or causing nasal obstructions. Nasal obstruction can be common after nose job surgeries if too much cartilage was removed at the time of surgery. The two most common sites causing nasal obstruction are the internal nasal valve (a narrowed bridge) and external nasal valve (nostril collapse). Both types of obstructions can be fixed using cartilage grafts during revision rhinoplasty in San Diego. WHAT IS A DICED CARTILAGE GRAFT? Costal cartilage: the first part of the procedure is to obtain enough rib cartilage for all of the grafts necessary to complete the rhinoplasty. Rib cartilage can be from the patients own body or from a cadaver. The cartilage is chopped into very tiny pieces, typically less than 1 mm in size. Cartilage pieces measuring more than 2 mm can result in contour irregularities or lumps along the bridge. DCG’s are one of many ways to add height to the bridge of the nose. The advantages of DCG’s is that they are less likely to warp or bend after surgery. Compared to implants, DCG’s are less likely to get infected. Disadvantages of DCG’s include losing height and widening over time. Are you a better candidate for DCG’s or intact rib dorsal onlay grafts? During your consultation Dr. Kolstad can help you decide which technique is best for your nose. WHAT ARE ALAR STRUT AND ALAR BATTEN GRAFTS? Alar strut and alar batten grafts are used to support the nostrils in shape and function. Many patients complain of nasal obstruction and tightness in the nose. The most common causes of nasal obstruction are deviated septums and enlarged turbinates. Internal nasal obstruction caused by the septum and turbinates can be addressed during or without a rhinoplasty surgery. External nasal obstructions are frequently caused by weak, floppy nostrils. If your nostrils collapse with moderate inspiration you my benefit from alar strut grafts. Dr. Kolstad uses cartilage to support and strengthen the nostrils to prevent their collapse. In addition to making the nostrils stronger alar batten grafts can be used to make the nostrils more symmetric. A nasal tip that is crooked and asymmetric can be reshaped using batten grafting. Dr. Kolstad typically uses septal cartilage for tip grafting but rib (costal) and ear (auricular) are secondary sources. WHAT IS A RADIX GRAFT? The height and position of the radix vary across ethnicities. Persons of Asian and African descent tend to have a very low, flat radix. The highest part of the nose typically originates at the midpupil level. Middle Eastern, Hispanic and Caucasion noses have a higher radix, typically at the level of the upper eyelid. Radix grafting refers to adding height to the highest part of the nose. Very soft cartilage can be placed in this area to straighten a very large dorsal hump. 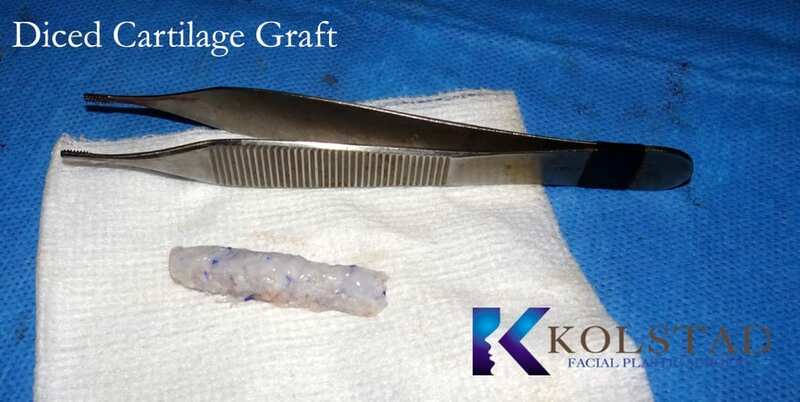 Dr. Kolstad typically uses morsalized septal cartilage or lower lateral cartilage for his radix grafting. Adding height to the top of the nose not only straightens the bridge of the nose but improves the nasofrontal angle. The radix is the highest part of the nose. The radix blends into the frontal bone and should be the least projected part of the nasal bridge. Asian and African noses tend to have very low profile radices, frequently needing augmentation. Easter European and Middle Eastern noses can have very prominent radices, frequently needing reduction. People with a prominent radix typically have a large dorsal hump as well. Removing the hump on the bridge of the nose is difficult in the setting of a projected radix. The radix requires specialized instruments to reduce. The frontal sinus can be located deep to the radix limiting the amount of radix reduction. The skin covering the radix is thick and does not always contract to the reduced radix projection. WHAT IS THE BEST ROTATION FOR MY NOSE? What is the ideal amount of tip rotation for you? That is entirely dependent on what you think looks right for your nose and face. Period. Although rhinoplasty is not precise enough to choos e the exact angle of rotation, you can typically choose to keep the rotation the same, slightly increase or slightly decrease it. Simply changing the angle or rotation will not alter the width or definition of the nasal tip. 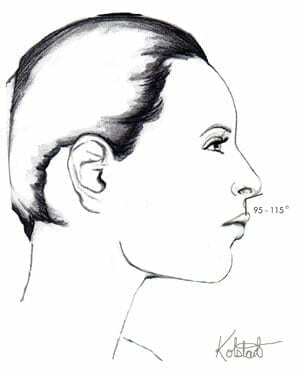 Nasal tip rotation is evaluated on profile view. It is the angle between the under side of the nose and the upper lip. According to the ‘experts’ the ideal tip rotation is estimated to be between 95 – 115 degrees for women and 90 degrees for men. Nasal tip angle frequently depends on ethnicity. Noses of Asian descent can naturally have a very high degree of rotation, frequently over 120 degrees. Middle Eastern and Hispanic rhinoplasty patients frequently complain of a drooping nasal tip. Recovery from rhinoplasty is easier then you might think. It is uncommon for patients to complain of pain with many only using prescription pain medicine for the first two days. Your procedure will be performed under anesthesia, and you will require a ride home after your surgery. Dr. Kolstad will call you or a family member on the night of surgery to make sure that you are feeling ok and to answer any questions. Bruising and swelling after surgery should be expected. “Raccoon eyes” are almost always part of rhinoplasty surgery and improve over the course of a week or two. Dr. Kolstad recommends purchasing thick cover up make-up prior to the procedure if you are concerned about bruising. 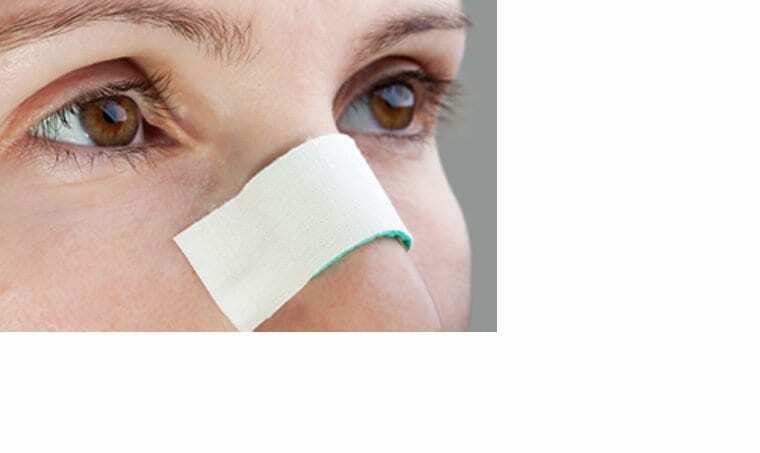 During the first few days after surgery ice packs placed around the nose will minimize any bruising. You should refrain from strenuous activities for two to three weeks. Pushing the limits early in the recovery process can lead to delayed healing and difficulties. Dr. Kolstad will inform you when it is safe to resume exercising. 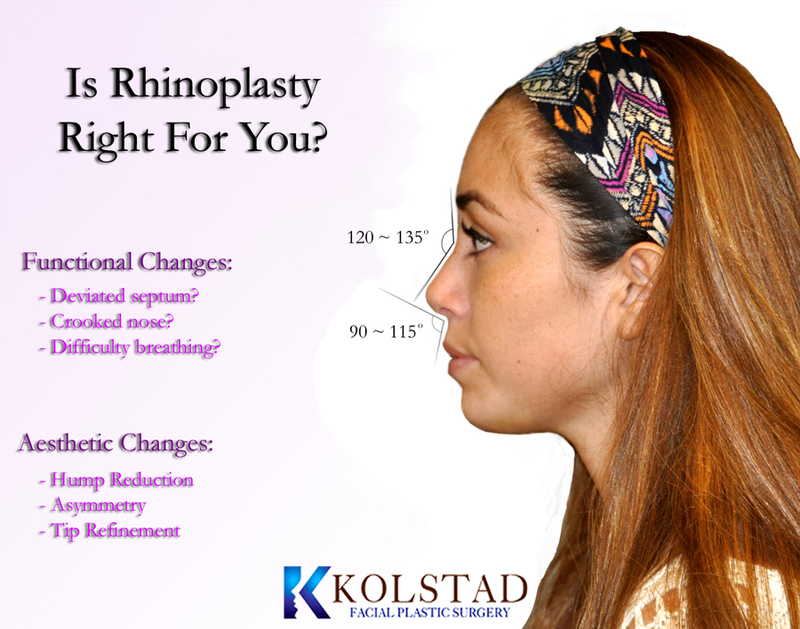 If you have questions about rhinoplasty surgery, please contact Kolstad Facial Plastic Surgery to schedule a consultation with Dr. Kolstad. You may call our office at 858.859.2563 to schedule your appointment today. We are conveniently located in in La Jolla between I5 and I 805. We serve men and women in La Jolla, Del Mar, San Diego, Rancho Santa Fe, Solano Beach, Encinitas and Southern California. If you have questions about injectable rhinoplasty surgery, please contact Kolstad Facial Plastic Surgery to schedule a consultation with Dr. Kolstad. You may call our office at 858.859.2563 to schedule your appointment today. We are conveniently located in in La Jolla between I5 and I 805. We serve men and women in La Jolla, Del Mar, San Diego, Rancho Santa Fe, Solano Beach, Encinitas and Southern California. Why Do I Have Dark Circles Under My Eyes a Month After Rhinoplasty? 1) Nonsurgical rhinoplasty: In the office injectable fillers like Juvederm or Voluma can be placed along the bridge of your nose to add height. There is minimal downtime, it is economical, and the fillers last about a year. 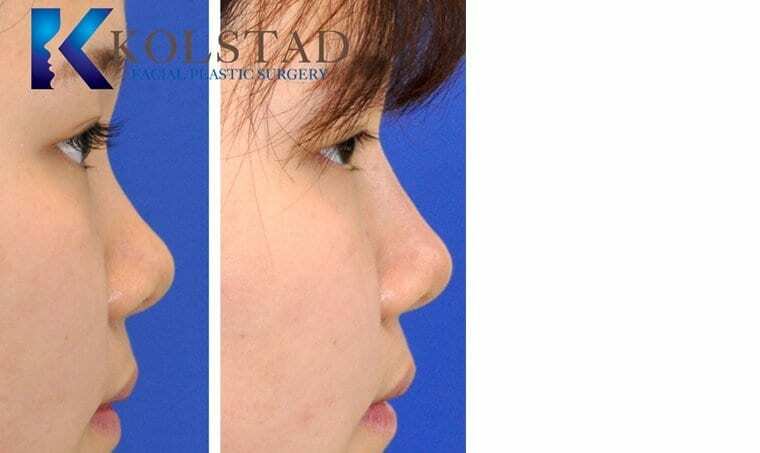 If you have questions about Asian rhinoplasty surgery, please contact Kolstad Facial Plastic Surgery to schedule a consultation with Dr. Kolstad. You may call our office at 858.859.2563 to schedule your appointment today. We are conveniently located in in La Jolla between I5 and I 805. We serve men and women in La Jolla, Del Mar, San Diego, Rancho Santa Fe, Solano Beach, Encinitas and Southern California. How Much Does A Nosejob Cost? In addition, every surgeon will charge a little bit differently based on expertise, availability and reputation. It is important to remember that the cheapest option is frequently not the best deal. You only get one nose, you should only trust it to a specialist. 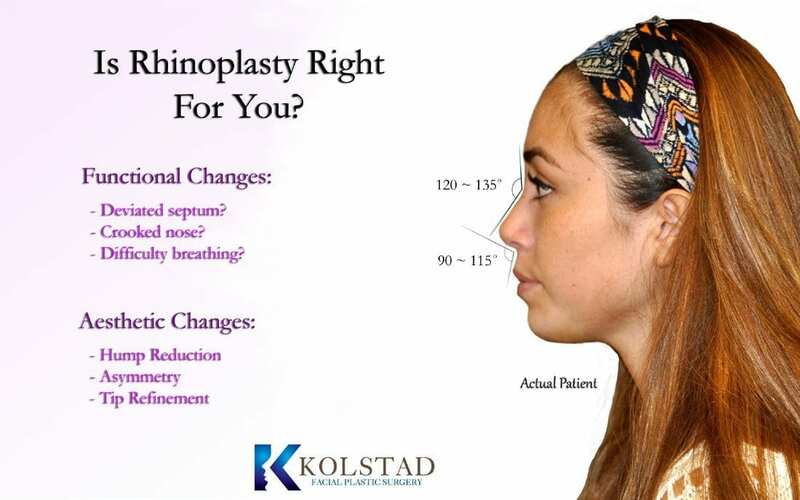 If you have questions about revision rhinoplasty surgery, please contact Kolstad Facial Plastic Surgery to schedule a consultation with Dr. Kolstad. You may call our office at 858.859.2563 to schedule your appointment today. We are conveniently located in in La Jolla between I5 and I 805. We serve men and women in La Jolla, Del Mar, San Diego, Rancho Santa Fe, Solano Beach, Encinitas and Southern California. Many of our Asian patients are not looking to Westernize their nose. Instead they are seeking to augment a diminutive nasal bridge. Adding volume to a diminutive nasal bridge can have a dramatic impact on the entire face. 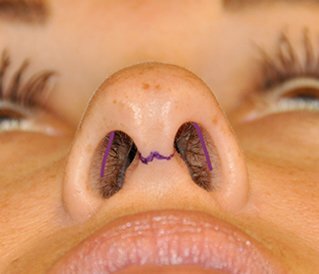 The nasal bridge can be permanently enhanced during surgery or temporarily augmented using nonsurgical rhinoplasty. Injectable rhinoplasty is performed in the office and uses fillers such as Juvederm or Radiesse to add volume to a small nasal bridge. Dr. Kolstad is a San Diego Facial Plastic Surgeon specializing in rhinoplasty that improves both the nasal shape and function . 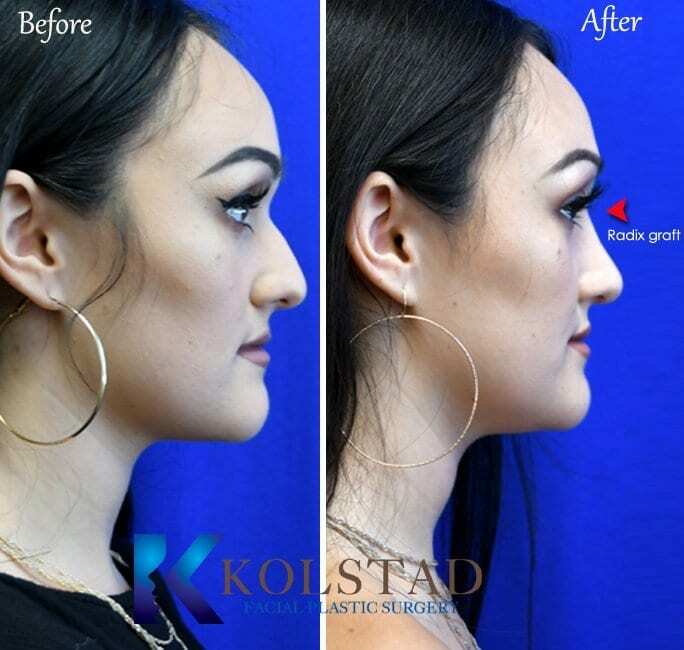 If you are considering Asian rhinoplasty in San Diego please contact Kolstad Facial Plastic Surgery to schedule a consultation with Dr. Kolstad. You may call our office at 858.859.2563 to schedule your appointment today. We are conveniently located in in La Jolla between I5 and I 805. We serve men and women in La Jolla, Del Mar, San Diego, Rancho Santa Fe, Solano Beach, Encinitas and Southern California. To schedule an appointment for Rhinoplasty in La Jolla, San Diego and the surrounding areas call us at (858) 859-2563 or get in touch with the form below.